where your original material has been copied without your permission. We will change to the LINK to your site. Thank you. New product announcements are made nearly every day. I subscribe to many trade journals and each is filled with hundreds of flashy advertisements. But, only a few of those product ads catch my eye. Since I’m a circuit designer, I especially like those components that trigger many new application ideas in my mind. Sometimes it is the smallest products that are the most useful. Tiny surface mounted components that perform a nice little function have countless applications. I also like anything that keeps battery power consumption low. These days you can do many interesting things with a well-designed circuit powered from just a few tiny button battery cells. I often discovered new products in surplus electronic catalogs. The surplus companies often buy up stock that came from companies that went out of business. Bad marketing or bad management may have killed a perfectly good product idea. Their loss can be your gain if you can spot the bargain. David A. Johnson, P.E. I love the idea of a relay which can handle lots of power with very little extra energy. Most relays draw constant power to keep contacts closed. Latching relays have two stable mechanical states. These devices can be opened or closed with a short 20ms 12v pulse. The lack of a constant coil current can really add up in power savings. Applications for these things are endless. There are a lot of off-grid solar power systems which use large battery banks. Battery power sometimes has to be disconnected when the battery voltage drops below a critical point. This is a perfect application for a latching relay. 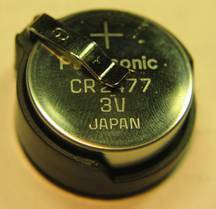 Likewise, when a battery is fully charged, power to the battery may have to be disconnected to prevent battery overcharging. Also, as can often happen with wind generators, power from the wind turbine may have diverted away from the battery to either a dummy resistive load or some other energy storage system, when the battery is full and there is excess wind energy. All of these applications could be handled with these beefy latching relays. A 200 Amp relay used in a 48v DC battery bank could handle nearly 10KW of power. 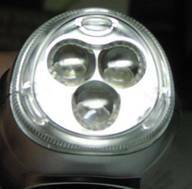 The crank generator type flashlight shown below produces a nice bright light from three focused white LEDs. I opened the assembly up and disconnected the brush type generator. With vigorous cranking I measured the output at 5v DC into a 12 ohm load, which means 400ma of current. The rechargeable lithium battery measured 20mm in diameter and 3mm thick. Based in this information, I would guess that the Amp-hour capacity of the battery would be about 50ma-hours. If the current through each LED was set at about 20ma, that put the operational time at around 1 hour with a fully charged battery. 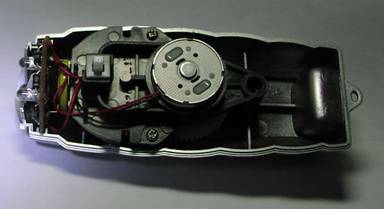 The circuit used a bridge rectifier, so the crank motion could go clockwise or counterclockwise. There does not appear to be any voltage control, so the battery could be damaged due to overcharging. It would be interesting to try use the 2 watt generator for some other applications. 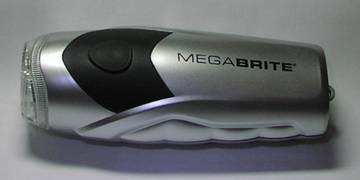 At the very least, with this kind of flashlight product, the lithium ion battery size could be increased to perhaps a full Amp-hour. That would allow the unit to operate for a much longer time. A fully discharged battery might take a full hour of vigorous cranking to charge the thing up. Once charged, the larger battery should keep the light going for perhaps 12 or more hours. The +5v output should be able to feed power into a cell phone as well. A while back I had a project which needed a 3v battery. The product needed to operate for more than a year between battery changes. The current draw was such that the battery had to have an Amp-hour rating in excess of 750ma-hours. A couple AAA or AAA cells would have worked but they took up quite a bit of space. After looking around, I found a nice lithium coin cell and holder which were perfect for my application. 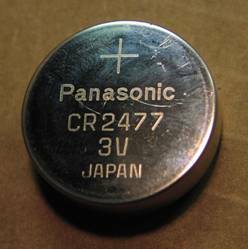 The Panasonic CR2477 has a 1000ma-hour rating. The cell diameter is only 24mm. A battery holder from Memory Protection Devices makes for an easy battery replacement. Some 30+ years ago, I worked for Hewlett Packard (HP) down in Colorado Springs Colorado. Back then, any calculations had to be done with mechanical slide rules. 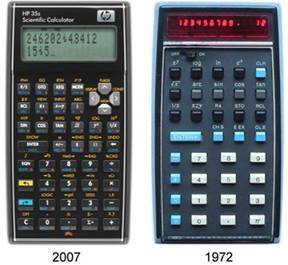 In 1972, HP came out with their first line of scientific calculators, the HP35 as shown below. I was able to get a big discount and so I bought my first RPN (reverse Polish Notation) machine. 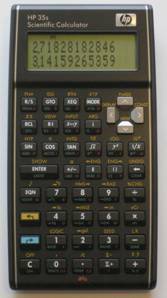 If you have never used a RPN calculator, you should try one. The method requires fewer key strokes and is perfect for many complex scientific calculations. After 30 years of using RPN calculators I would never want to use anything else. My original HP35 still sits on my work bench, where I often use it to calculate needed component values. Few electronic products can boast valuable services for 30+ years. To celebrate the 35 years since the original HP35, HP decided to release the HP35s. As shown below, it has a lot more features than the 35 and still uses the wonderful RPN notation. Light emitting diodes (LEDs) are becoming more and more popular. However, in spite of their high efficiency, they still do produce some heat. Heat has been attributed to the slow degradation and fading of many power white LEDs. So, there have been many attempts to get rid of that extra heat from the part. Some systems have been using aluminum fins and even some cleaver electric fan designs. 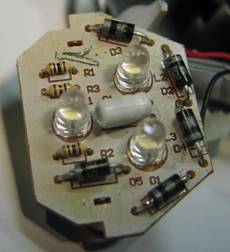 A company called “Eternal LED” has a neat idea of using paraffin wax surrounding the white LED inside their Edison base lamp assembly to keep the device cool. It appears that the case is plastic. Once heated, the wax forms a viscous fluid, which can efficiently move heat away from the parts inside the assembly to the walls of the lamp, where it can be dissipated. The solid to liquid phase change of the wax also helps to remove excess heat through “heat of fusion” physics. I might try using this technique myself in some LED lights I have in mind. The liquid cooling concept could work in other geometries, such a square or even flat light fixture shapes. 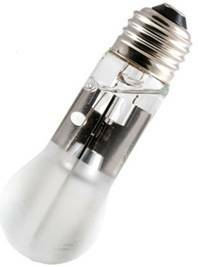 The HydraLux-4 LED bulb uses just 4 watts of power yet produces as much light as 25w incandescent lamp. The lamp is a bit pricey at $35 each but for some applications, where lamp access is difficult, it might be worth it. This is a neat part. I can imagine all kinds of applications for it. It is basically a three pin part. The input can range from 1.2v to 40 volts. The output current can range from 300uA to as high as 200ma. However, the power dissipation shouldn’t exceed about one watt. So, at the full 200ma, the voltage drop shouldn’t be allowed to exceed 4 volts. 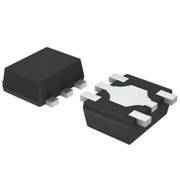 The nifty feature of this part is that the output current is set with two external resistors. The ratio of the two defines the output current. Typically, the set resistor is 20K. With a 20 ohm output resistor the current would be programmed for 20ma. One application for this part is shown below. 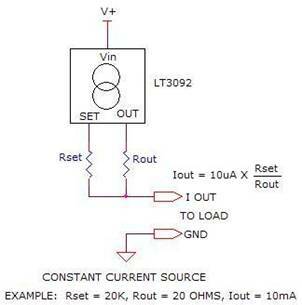 The LT3092 is programmed for a 100ma current source. Its output is connected to an unknown large value capacitor. By setting up an oscillator with a 1 volt trip voltage, a positive ramping voltage is produced across the capacitor. The ramp timing is determined by the equation dV/dT = I/C. If dV is 1 volt and I is 0.1 Amp then dT will be 10 seconds for a 1 Farad capacitor. The capacitor value is then T/10. A couple months ago my 84 year old mother in-law stayed at my house while she recovered from a stroke. To help her cope with being away from her Texas home and all of her friends there, we bought her a Magic Jack for $40. The device plugged into my laptop computer and into an extra cordless telephone system I had on hand. With this system my mother in-law was able to pick up the phone and make calls to Texas without any additional long distance charges. No, it was not a perfect system. There were some dropped calls, missed calls and at times there was excessive noise. 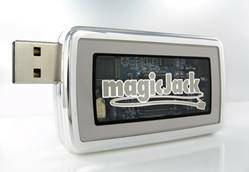 Installation of the Magic Jack was a snap and overall I was very pleased with the service. We did get the impression from the TV and Internet ads that by getting a Texas area code, people in that area code could call my mother in-law in Colorado without them being charged for a long distance charge. However, the calls were treated as a long distance call for them. In spite of some negatives, I still would highly recommend this device. I know my mother in-law appreciated having the freedom to make lots of calls and talk as long as she wanted. batteries are used, the electronic device will stop operating long before all the energy stored in the rechargeable battery has been depleted. 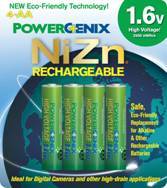 Enter the 1.6v nickel-zinc battery. The slightly higher voltage usually means operating times that are comparable to 1.5v alkaline batteries with the added advantage of being a rechargeable battery. rechargeable cell, which has 3 watt-hours of stored energy. But, the higher voltage may indeed mean longer operating times for a lot of portable electronic gear. As an added benefit, the battery is about 30% lighter in weight. Look for PowerGenix blister packs and matching chargers. I have big plans for this part. It performs many of the tasks I was going to do using a bunch more parts. Inside this tiny part is a sensitive Hall Effect magnetic field sensor, some logic, timing circuits and two latched CMOS outputs. One output changes state when the sensor detects a north pole magnetic field and the second output is activated with a south pole field. The real beauty of this part is that is does this while drawing only 12 microamps of current at 3 volts. 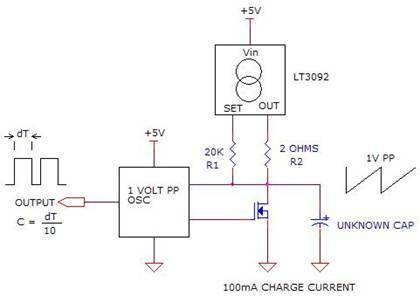 I’m going to design a nice battery charge current indicator using thing part. The battery powered indicator will show which direction current flows. 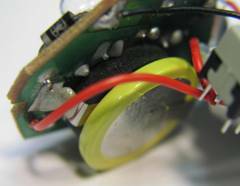 A green LED will show current going into the battery and a red LED will show current flowing out of the battery. If I flash the LEDs I can operate the indicator for years from one 3vbattery. delete links to material that have been copied without your permission. Thank you. of David A. Johnson, P.E. (Dave Johnson & Associates ) unless otherwise noted. All material is provided "as is" without guarantees or warranty of any kind, either expressed or implied.